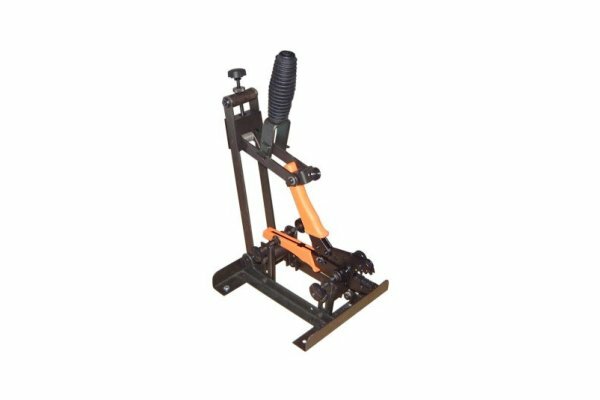 The Crimp Cradle uses a highly efficient tooling set which provides a mechanical advantage, when hand crimping of approximately 10 to 1. If a hand tool requires 20Kg of operating force the Crimp Cradle will require only 2Kg to perform the same operation. 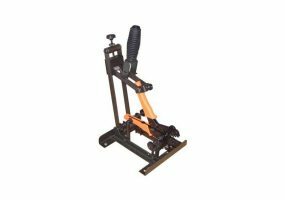 Clamps in the base of the unit, in conjunction with two roller bar tool holders, can be raised, lowered or rotated to accommodate 90% of all hand crimp tools available. This includes both single and double arm movement tools. 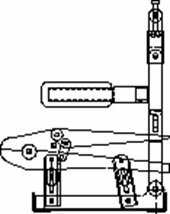 A single adjustable clamping mechanism attaches to the upper handle of the crimp tool. Hand tool fixed in position with Crimp Cradle ready to use. Showing Hand Tool in optimum position for maximum force reduction. Can double the output of hand crimping operations due to less handling and shorter cycle times. Reduces fatigue due to 90% less effort. Greatly reduces risk of Repetitive Strain Injuries. Squeeze force judgment is eliminated as tool reaches a positive stop position at the end of each operation cycle. Reduces rejects due to insertion difficulties when compared to conventional hand use. Safer than many small bench pneumatic tools and a fraction of the cost. Safe, fast, one handed operation. Manual operation, no power or compressed air required. Portable, easily bench mounted by clamps or can be bolted down for permanent sitting. Quick and easy to set up and adjust. The Crimp Cradle will accept hand tools with an open span between handles of up to 305mm (12").